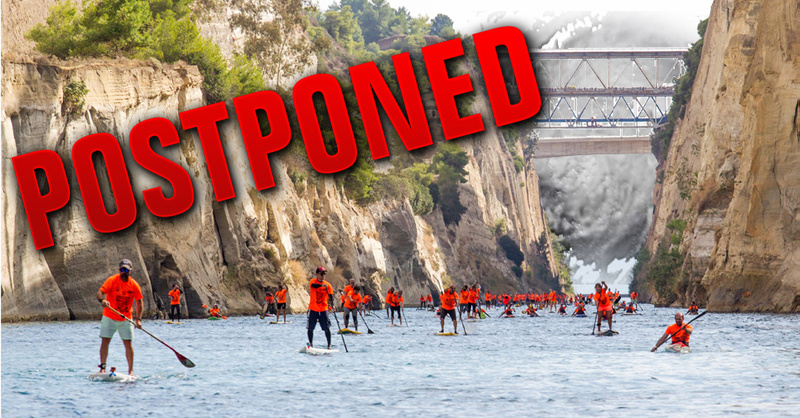 The extremely bad weather finally managed to postpone 8th Corinth Canal SUP Crossing 2018. The forecast is now very clear. Strong winds and heavy rain seem to be the weather until Sunday. After consulting every principal and authority involved, it is mandatory first of all for safety reasons, to postpone and reschedule the event. Another crucial reason that is affected by the weather is the water flow inside the Canal. The stable flow switch (every 5 hours), that determine the side and the time of the start, can be affected with no prediction even during the event under these conditions. Nevertheless, nothing is going to ruin the bigger SUP event in Greece. The unique Corinth Crossing, with 461 registered participants this year, will be the second bigger in Europe, after Nautic SUP Crossing in Paris. If any of the participants cannot join the event next Sunday, must send an email (at info@corinthcanalsupcrossing.gr) until Tuesday 2/10/18 in order to have a refund for the cost of participation. We are deeply sorry, for every participant from abroad that cannot rearrange booked flights, hotel, etc. for next Sunday. For all of these people not only we will refund the cost but we are giving a FREE PASS for the next Corinth Canal SUP Crossing in 2019 as a compliment. For all the rest, see you at Corinth in 9 days!